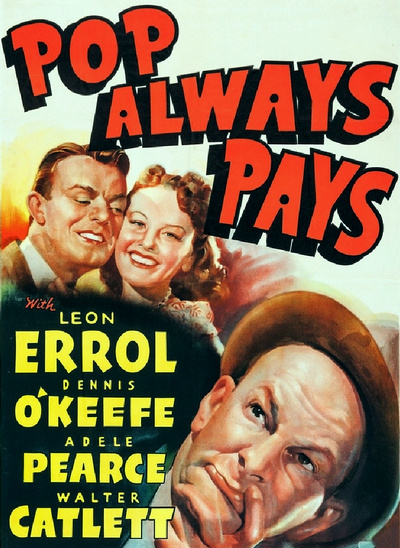 One of the many comedies with which balding Australian-born Leon Errol set audiences of the Thirties and Forties laughing. In Pop Always Pays, Henry Brewster (Errol) disapproves of the romance between his daughter Edna (Adele Pearce, aka Pamela Blake) and local spendthrift Jeff Thompson (Dennis O'Keefe). He finally agrees to give his blessing to the union if Jeff is able to save $1000 (approximately $17,600 in today's dollars), whereupon Brewster will match Jeff's thousand with the same amount as a wedding present. Confident that Jeff will never be able to raise that kind of cash, Brewster is decidedly nonplussed when the boy does come up with the necessary funds-especially since Brewster doesn't have his thousand, and isn't likely to ever have it.